“S. Klein, On The Square,” or simply “S. 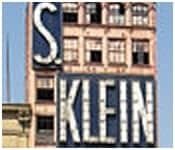 Klein” was a popular priced department store chain based in New York City that is now defunct. Due in part to its reputation for bargains, S. Klein was known as the store to pick through racks and bins searching for the ultimate find. In the 1950s sitcom I Love Lucy, Ethel Mertz often mentioned “pawing through racks” at either S. Klein, or the bargain basement at Gimbels. In the 1970s sitcom All In The Family, S. Klein was mentioned as Edith Bunker’s favorite store.